To provide the best possible healthcare for the people we serve, it is essential that GP Federations attract and retain staff who are appropriately qualified, professional in the service they deliver, happy and productive in their work and committed to lifelong learning and developing in their role. This information pack is designed to provide you with a brief overview of the role of GP Federations and the terms and conditions of employment within GP Federations and information which should assist you in the completion of your application form. Thank you for your interest in applying for a position within GP Federations and we look forward to receiving your application. Evidence from both the Royal College of GPs and the Kings Fund points to the fact that it is vital that GP federations, are uniquely placed at the centre of the primary care arena, and that they can pave the way for greatly improving quality standards and accessibility to care. GP Federations not only provide better outcomes for patients but will also result in significant and sustainable efficiencies for the service. As well as this priority objective, Federations will act as a catalyst for better outcomes in the other major strategic objectives of our service namely; GMS PLUS/SHIFT LEFT/TYC/Donaldson/GP recruitment/Federation alignment to trusts and other key stakeholders/out of hours/7 day working/potential gains/improved efficiency/better patient outcomes/sustainability/reform. In Northern Ireland, the creation of the federation model has been both led and funded by GPs themselves. Their boundaries are in line with the current boundaries for Integrated Care Partnerships. Limited by Guarantee in the not for profit sector. Currently there are 17 Federations incorporated covering 1.8 million of a patient population. Northern Ireland is the only part of the United Kingdom that has a unified model of Federations governed by a unified Members Agreement covering its entire population. Governance arrangements are as outlined in Fig 1. 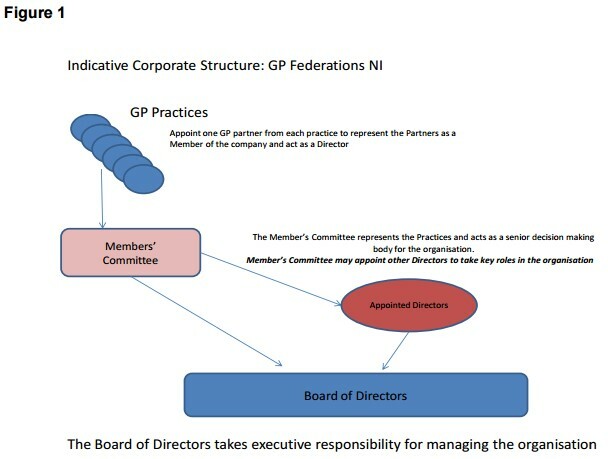 Within this organisational model the GP practice is sovereign with the number of “Member Directors” being one per practice. Member Directors have formed a Members’ Committee in which the major governance authority of the organisation in vested. The Members’ Committee have the authority to appoint “Directors” in line with the rules of the Members Agreement. It is these Directors that form the “Board of Directors” who are charged within the delegated authority of the members to take responsibility for the managing of their own Federation. Below is a list of the 17 Federations and the chair of each Federation. For more information contact the Operations Managers. Operations Manager – To be appointed in the interim contact Joan Cassidy in the Western Area.